After a few family vacations full of amusement parks or children&apos;s museums, parents long for an adult activity where their children are welcome. Monterey County has perfected creative ways to please every member of the clan. 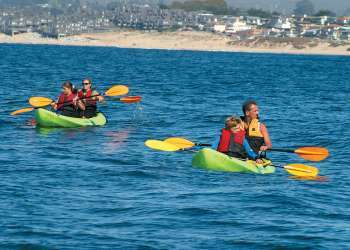 Be the family hero and book these Monterey experiences for your next vacation. The most well-traveled parents catch their breath when they hike Big Sur cliffs, explore the Point Lobos tide pools or roam the talus caves of Pinnacles National Park. Kids can teach us a thing or two about the joy of exploring in these natural wonders. 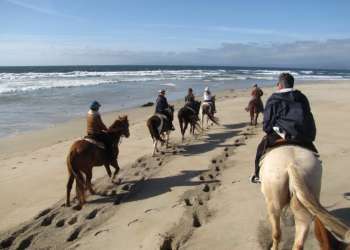 In addition to self-guided nature activities, Monterey County&apos;s parks have plenty of ranger-led excursions that cater to the whole family. Pfeiffer Big Sur State Park&apos;s Campfire program runs from Memorial Day through Labor Day, with multiple ranger-led hikes and walks daily. Tweens can get a taste of independence with hour-long "Junior Ranger" activities, giving Mom and Dad a chance to kick back at the campsite. Edu-vacation bonus: The Monterey Peninsula Regional Park District offers weekend hikes and nature exploration activities designed for kids from tots to teenagers as well as their parents. Introduce your toddler to butterflies in the morning, your tween to the adventure sport of geocacheing on an afternoon exploration, or your teen to owls on a special evening hike. Tweens and teens can even learn basic first aid skills at all-weekend classes. Who doesn&apos;t like fast cars? Kids will rev up to the auto races, while mom and dad can get up close and personal with the cars of their dreams. For parents, one of the best elements of a race at WeatherTech Raceway Laguna Seca is the relaxed atmosphere. Mom and Dad can bring in food and drink for the kids, set up camp chairs on the grass, and have a family picnic while watching the action. Children can also burn off steam with a trip to the playground near turns 5 and 6. For a totally immersive experience, reserve a campsite at the raceway and set up your home away from home. At many of the races, children will have the opportunity to meet racecar drivers. Younger children can participate in family activities in the racetrack infield, while older kids may want to browse the merchant booths and watch the live bands. Get dirty. Harvest honey. Pick organic vegetables. The best way to create a memorable experience with children is to get down and dirty alongside them, and several of Monterey County&apos;s farms offer endless options for "quality time." The Farm, located in Salinas, is a working farm designed to tell the story of Monterey County&apos;s agricultural heritage. Giant sculptures of farm hands are scattered throughout the fields, illustrating the acts of growing and harvesting food. Families can tour The Farm, meet real farmers, and learn how vegetables are grown. Kids can even visit farm animals such as goats, chickens and rabbits at The Farm&apos;s miniature zoo. Events throughout the year celebrate the seasons with activities and educational events. Families can also explore gardens from pioneering organic food producers Earthbound Farm. Earthbound Farm&apos;s Carmel Valley Farm Stand is surrounded by the Cut-Your-Own Herb Garden and a Kids&apos; Garden. Throughout the year, the Farm Stand has activities designed to educate children and their parents about organic farming and gardening. Reward your family after class with delicious local produce, organic ice cream and organic frozen yogurt from the Farm Stand. We know why this gem is great for children - but the Monterey Bay Aquarium is also a big draw for adults. Parents also giggle with abandon at the sea otters and gasp in awe at the Kelp Forest exhibit while learning a thing or two about our global commitment to ocean life. The family can take turns, first participating in child-focused hands-on activities, then enjoying some of the more tranquil and exotic exhibits. Meals in the dining room are several cuts above average zoo and aquarium fare; the Monterey Bay Aquarium Restaurant features grownup, sustainable cuisine devised by celebrity chef Cindy Pawlcyn as well as some of Monterey County&apos;s best views of Monterey Bay. In the Cannery Row area, check out A Taste of Monterey or Bargetto Winery. In Carmel Valley, Folktale Winery, Joyce Vineyards and Twisted Roots offer great outdoor patios. In the Salinas Valley, stop by the Scheid Vineyards tasting room in Greenfield, where kids can play bocce ball as their parents taste on the patio or Hahn Estates with a massive outdoor deck.